Compiled by Corinthian’s travel experts, U.A.E Top Ten has been designed as a reliable reference point to enable you to identify the absolutely unmissable Top Ten Sights in U.A.E as well as the most exciting U.A.E Travel Experiences, and U.A.E’s most notable hotels. There are of course besides a myriad of other marvels and wonders to been seen and experienced. Every list is by its very nature highly subjective and restricting ourselves to naming just ten has been no easy editorial task! We hope that our U.A.E Top Ten suggestions will provide a flavour of the country’s magic and will inspire you to explore further. On the U.A.E destination page you will find more detail; including an extensive list of private tour suggestions, a guide on where to travel, and our preferred hotels. Alternatively, call us! We would lo to hear from you. 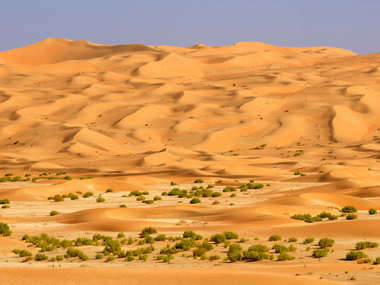 An immense sea of drifting sand, the Rub Al Khali (Empty Quarter) is the largest sandy desert on Earth, and is arguably THE highlight of any visit to the UAE. 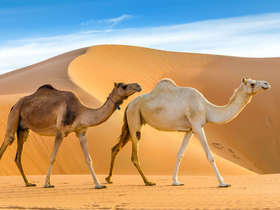 Visitors to the UAE can choose between exploring the Rub Al Khali on a thrilling early morning hot-air balloon ride or late afternoon sunset 4WD desert safari from either Dubai or Abu Dhabi. Another option is to relax in style at one of the luxury desert resorts for a few nights. The iconic 828 metre high Burj Khalifa Tower is the world’s tallest building and is an unmissable landmark on the Dubai skyline. 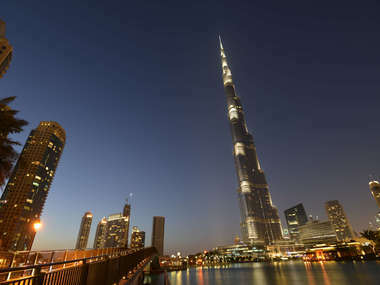 Designed by architects Skidmore, Owings & Merrill, the needle-like Burj Khalifa cost approximately US$ 1.5 billion and dominates ‘Downtown Dubai’. For some of the most astonishing views over Dubai we recommend taking the lift up to the 124th floor to the “At The Top” observation deck. 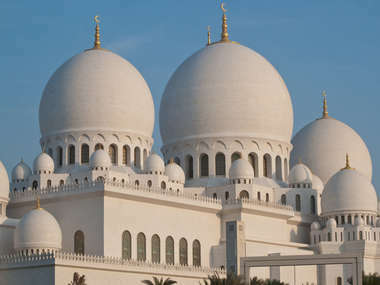 An architectural work of art, the Sheikh Zayed Mosque was the vision of Sheikh Zayed bin Sultan al Nayhan, the first president of the UAE. With its 82 white marble domes, four graceful and towering minarets, an enormous marble courtyard decorated with inlaid floral designs, and reflective pools comparisons are often made with the Taj Mahal. No expense has been spared on this supremely graceful building which also contains; columns encrusted with semi-precious stones, the world’s largest hand-knotted carpet, and one of the world’s largest chandeliers. 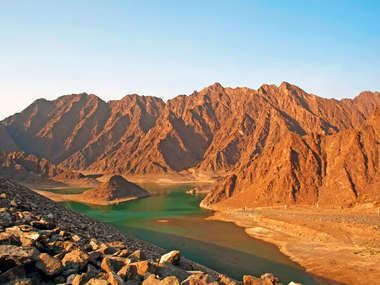 A journey into the barren and dramatic Hajar mountains will take you off the beaten path to discover some of the UAE’s most notable scenic and historical attractions. 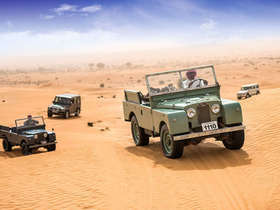 A 4WD safari from Dubai to the mountain resort of Hatta with its Heritage Village, rugged peaks and cool natural water pools, is one of the best ways introductions to the secrets of the Hajar. 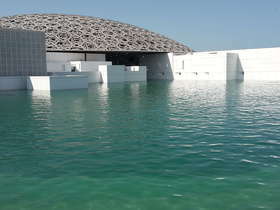 Alternatively, visit the mountainous emirate of Fujairah which is worlds away from 21st century Dubai and Abu Dhabi. The world famous Palm Jumeirah is one of three artificial archipelagos created from reclaimed land extending into the Gulf. 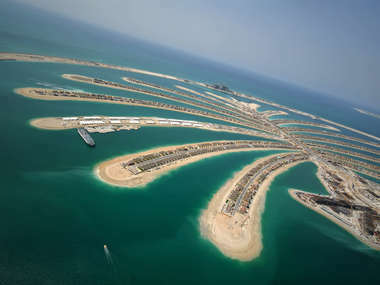 Construction of Palm Jumeirah, which is now home to a host of luxury hotels and villas, began in 2001 and used a staggering 94,000,000 cubic metres of sand and 7 millions tons of rock. A mono-rail runs down the trunk of the palm connecting its base with the landmark Atlantis hotel. The most memorable views of the Palm Jumeirah can be enjoyed from a seaplane scenic flight or whilst enjoying a civilised tea at the Burj Al Arab. The pulse of old Dubai is still tangible in the city’s ‘old’ centre cradling the Dubai Creek waterway. Here you will find the lively fruit and vegetable market, the glittering gold souq, and the aromatic lanes of the spice souq. A highlight of any visit to old Dubai is a boat ride on a traditional abra along the dhow lined creek. The neighbourhood of Bastakiya has a very Arabian feel to it with narrow ochre coloured lanes and coral stone houses that are dominated by elaborate wind-towers. 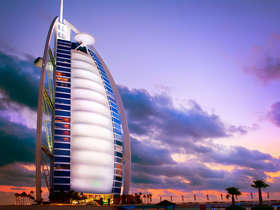 The instantly recognizable Burj Al Arab hotel has been consistently been voted as the most luxurious hotel in the world. This masterpiece of contemporary architecture is located on an artificial island off Dubai’s golden Jumeirah Beach and is decorated in a bright and glitzy style that is evocative of a contemporary Arabian fantasy. If you are not staying in one of the lavish 202 duplex suites it is still possible to visit the Burj Al Arab if you have a restaurant reservation or have booked high tea at the Skyview Bar on the hotel’s panoramic 27th floor. The first of its kind in the UAE, the superb collection of the Sharjah Museum of Islamic Civilization is dedicated to the display and interpretation of 1400 years of Islamic art. Some 5,000 artefacts ranging from carvings, ceramics, coins, glass, metalwork and calligraphy are beautifully displayed at the museum. 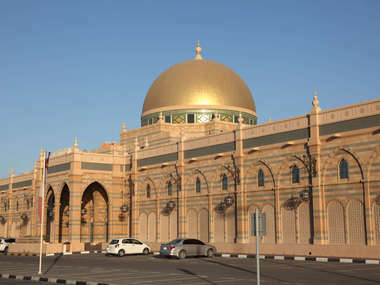 This fascinating Sharjah landmark and was originally a luxurious covered souq. 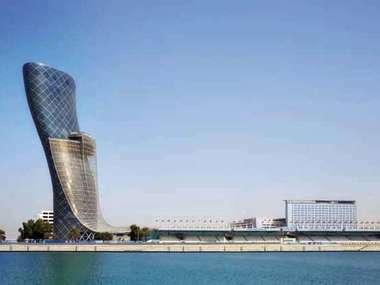 The iconic Capital Gate Tower on Abu Dhabi’s corniche has been designed with a striking gravity defying lean of 18 degrees. Also known as the ‘Leaning Tower of Abu Dhabi’, the Guinness Book of Records has certified Capital Gate building as the “World’s furthest leaning man-made-tower”. To experience the building at close quarters and to enjoy panoramic views over Abu Dhabi we recommend either lunch or dinner at the 18° degrees restaurant. 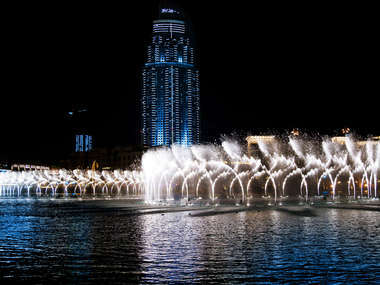 The mesmerising 275 m long Dubai Fountain can shoot jets of water 150 metres into the sky (equivalent to a 50 storey building) to the accompaniment of music. Designed by the same company responsible for the Fountains at the Bellagio Hotel in Las Vegas, the Dubai Fountain is the world’s largest choreographed fountain system and is particularly spectacular at night. Dinner overlooking the Dubai Fountain (and possibly the Burj Khalifa too!) at one of excellent Downtown Dubai restaurants is an unforgettable Dubai experience.